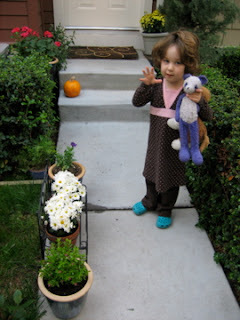 Our flowers were looking pretty sad after a summer of slugs and aphids, so Elise and I did some planting this morning. It was fun! Some crisanthemums, some daisies, some "false heather". Everything looks fresh and new and with any luck will keep the neighbors' dogs off the grass. In an attractive way. We met a nice neighborhood kitty who exchanged eskimo kisses with Elise. Isn't that a pretty kitty? 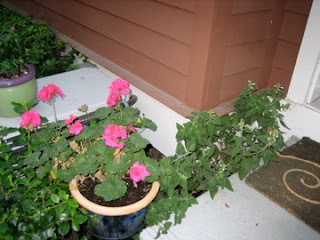 The pink geranium has been blooming non-stop all summer. Next to it is the butterfly bush that suffered slug damage early in the season. 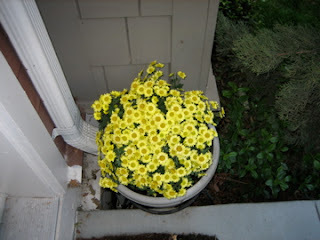 Now, it's been transplanted to the actual dirt next to the front door in hopes of disguising some of its faults. That, and it just looks really pretty peeking up next to the steps. 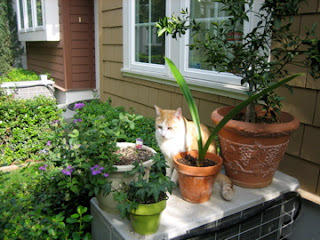 I was especially pleased with this choice to fill the planter where the butterfly bush used to live. It's like having a pot of sunshine on my doorstep! So, those are our gardening pictures. We're pretty happy with our morning's handiwork. 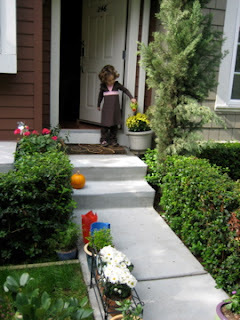 We're going to be doing some crafts after naptime today-I hope you have something similarly fun to do with your day! I knew it could be done!